Sometimes, a great hashtag campaign is born out of being in the right place at the right time. 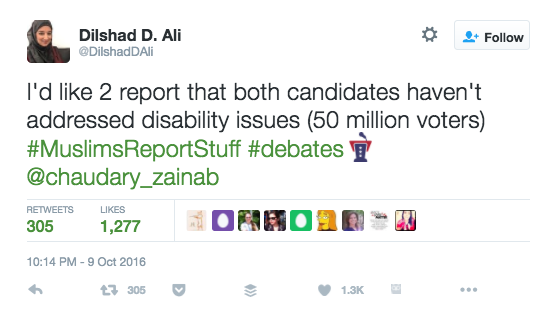 Case in point: During the second 2016 Presidential debate, one Brooklyn professor’s tweet, and a hashtag campaign that followed, won hearts and minds better than politics did. In this blog post, we’ll talk about the impetus, the campaign, and the strategy behind it. 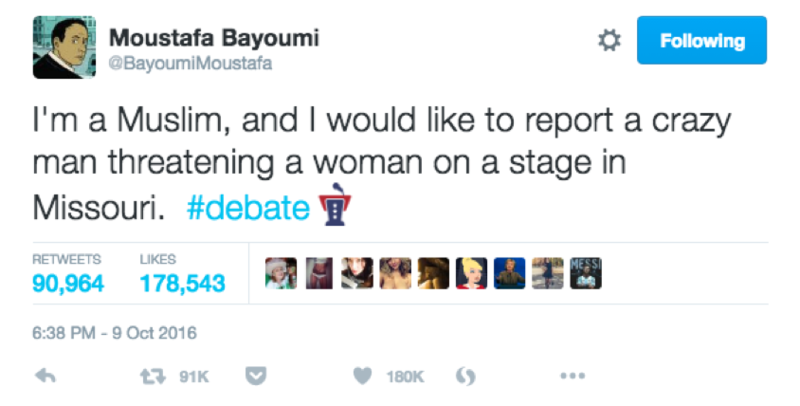 This sparked the idea on the ReThink team to start a hashtag #MuslimsReportStuff, to pair with the already trending #Debate, and use it to list funny or banal things that Muslims could report about. Folks kicked things off on their personal Twitter handles (being mindful of the c3/c4 electioneering divide that nonprofits need to remember) before pushing out to coalition members via listservs with examples to follow. Though the hashtag took a while to pick up, it gained steam very quickly, and even trended nationally once or twice during the course of the debate. By the end of the debate, the word “Muslims” was trending, with many of the hashtagged tweets in the “top tweets” spot. The hashtag kept gaining the day after the debate, and was easily everybody’s favorite, cathartic post-debate trend to follow on Twitter. Re-tweets and mentions were overwhelmingly positive. 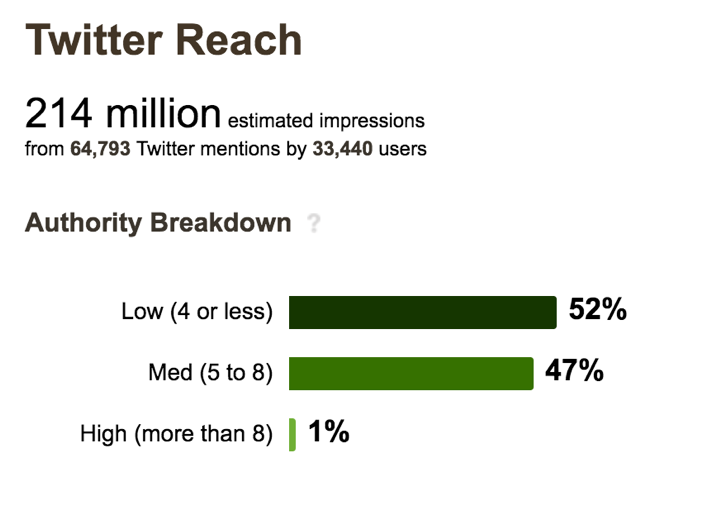 As the campaign wound down the next afternoon, the campaign had a reach of 214 million impressions, with the breakdown below. Celebrities engaged with the campaign as well, with Yvette Nicole Brown, Orlando Jones, Jordan Peele, Shonda Rhimes, Betty White and others re-tweeting and/or favoriting tweets from the campaign, and comedian Kumail Nanjiani tweeting out using the hashtag. At the end of the night, the campaign also made Twitter Moments. Using #Debate alongside #MuslimsReportStuff to piggyback on the existing trend and build in a new one. 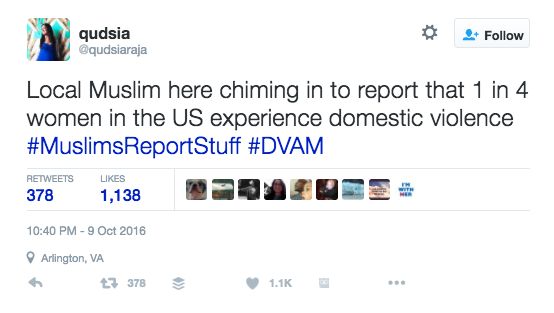 If we had just started using #MuslimsReportStuff without also including the #Debate hashtag, we would have only been talking to our existing audience, and the campaign would not have been nearly as successful. Retweeting the tweet that started things off (in this case, Professor Bayoumi’s, which was gaining traction on Twitter) with the new hashtag. This was both giving him a hat tip for the original idea, while also making sure that those following the new campaign saw the tweet. Utilizing individual account and individual voices as well as organizational accounts. Individuals who work on our issues can take more liberties with the language, tone, and content of their personal tweets than tweets sent from main organizational handles. This campaign capitalized on the individual voices to raise the profile of the campaign, while also being on the safe side of election laws. Individuals could get more political with their tweets, while organizations could use the same hashtag to talk about policy related to the theme without any need for direct coordination. Pushing out the campaign over social networks, including Facebook, once the campaign officially started. Once we decided to go for it, we needed to tell people about it. Reaching out to known allies is a great way to get a campaign like this off the ground. What are your favorite ways to break into a hectic conversation like the #debate? Tweet to us @rethink_media and let us know! Are You Going to Netroots This Year? Let's Meet Up!